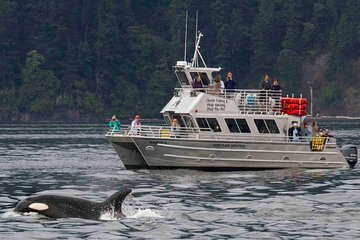 Kommen Sie mit den Killerwalen vor Orcas Island, der größten der San Juan Islands in der Nähe von Seattle, auf diese geführte 3,5-stündige Walbeobachtungstour von Eastsound aus nahe. Steigen Sie an Bord eines Blackfish-Flottenschiffs unter der Führung von Naturführern und Kapitänen durch eine der malerischsten Landschaften im pazifischen Nordwesten und suchen Sie nach Orca, Buckelwale und Grauwalen. Auf dem Weg können Sie die Tierwelt des Ozeans in ihrer natürlichen Umgebung sehen, wie Robben, Schweinswale, Seelöwen und Otter - sowie eine Vielzahl von Vögeln und mehr. Sichtungen sind von April bis Anfang September garantiert. Great trip we got to see a humpback whale, a pod of 5 orca whales, seals and a few dolphins. All of the sea creatures were needed to be seen by binoculars for the animals safety, which is understandable. We could see them with the naked eye but from a distance of at least 100 feet. We were the last to get on the boat and so sat on the sides of the boat which was very cold and windy. We were given a very large warm jacket to wear which was a life saver. Without it I think I would have had hypothermia. The naturalist was not in a position where we could hear him but did spend some time to answer our questions individually. It was a memorable experience. Its always a mixed adventure going out on the open sea. Both the naturalist and driver were personable and helpful. I wish we had known about the rule that we couldn't get any closer to the whales. I was disappointed that we could only see them as small black and white fish with fins in the distance. There was a lot of hype about which ones we were going to see---how could anyone identify them? Perhaps a Kayak trip would have been better and I would consider that next time. However, I did enjoy our naturalist Bobby's education of us and felt he was very knowledgable and entertaining. The pilot was a bit curt with some of the passengers, but the boat trip was comfortable. Great time! Was on the Orcas in 25 minutes and watched them for quite a while. Our guide was great and educated us on many things connected with the wildlife and San Juan Islands.